We spoke with Bob Collins, the owner of Pizza Bob’s, to hear some of his pizza-related stories from the 1960s through to today. The view of Pizza Bob's Classic Pie from Parkdale Boulevard. Photograph by Karin Olafson. Pizza Bob’s Classic Pie wasn’t always Pizza Bob’s, but it has always served Neapolitan-style pizza. Originally a Tom’s House of Pizza when the place first opened in 1964, it was the only restaurant in the area that served pizza. Back then, this location was on the edge of the city – there was a drive-in and a gravel pit and Montgomery was off in the distance. 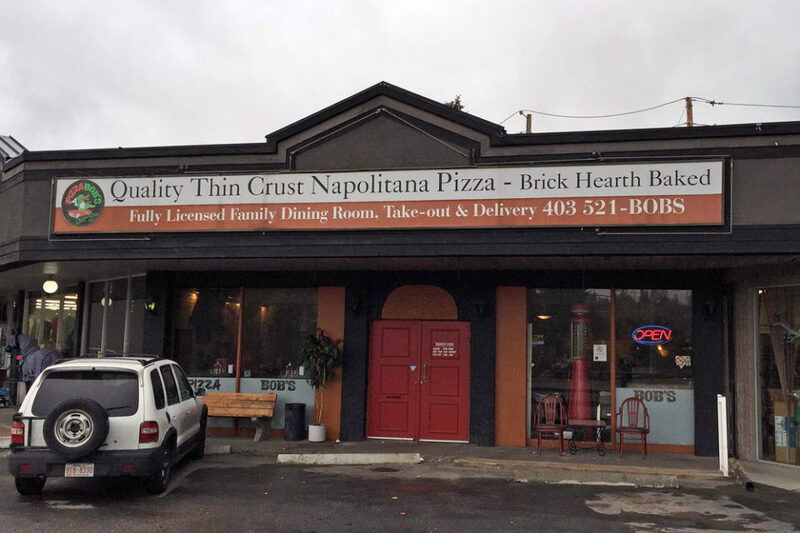 According to Bob Collins, the owner of Pizza Bob’s, this very restaurant was one of the first in Calgary to dedicate itself only to pizza. “Ye Olde Pizza Joint on 16th Avenue was the very first, I think, and Tom’s House of Pizza followed,” says Collins. His appetite for pizza grew once he tried different varieties, which was easy to do after he started working at the pizza place in 1970. Bob Collins has been working at 2610 Kensington Rd. (on and off) since he was 17 years old. As a high school kid, Collins worked at Tom’s House of Pizza part time, bussing tables and doing dishes. After a stint away, Collins returned to Tom’s in 1975 and bought the location in 1977. It became Pizza Bob’s only in 1999. Collins became a pizza master working at Tom’s House of Pizza, but made a few changes to the recipes and to the menu when it became Pizza Bob’s in 1999. Simply, it’s healthier now. The Pizza Bob’s of the 1990s and early 2000s had a very different vibe from the Pizza Bob’s of 2016. For starters, a jukebox sat in the corner by the door. The ceiling was white, the walls were green and there were a lot of antique items strung throughout the restaurant. Most noticeable though, was the jungle-themed mural on the restaurant’s east-facing wall. “The cartoon-like mural took up that whole wall,” says Collins. “There was a gorilla climbing a tree and eating a pizza and it was a whole jungle scene, but with pizza boxes.” It was quirky and it’s a thing of the past – Collins doesn’t have any photographs of the old mural wall. There are 16 feature pizzas on Pizza Bob’s menu and Collins has a hard time picking which one is the crowd favourite. “If I removed any of those pizzas, someone would get upset,” says Collins. He guesses The Greek, The Special or the Traditional are three of the most popular. And there are two pizzas on the menu that have a story of their own. Amy’s Favourite is named after a Pizza Bob’s staff member. “Amy came up to me one day and said, ‘You’ve got to try this pizza! I came up with it.’ She was so proud of it and I thought it would appeal to a lot of people,” says Collins. Pizza Bob’s became a live music venue about three years ago. It’s not just adults who perform live on the Pizza Bob’s stage. As an all-ages venue, Pizza Bob’s will get kids up on stage performing, too. “There’s a music teacher who’s a Pizza Bob’s regular. He likes our stage because he can get his younger students out here and performing for their friends and family,” says Collins. They have, and maybe one day Collins will take to the stage, too – he’s learning to play drums from this same teacher.